This is a relatively ‘slim’ Kotoko rider in full armour on his horse with a dagger in his right hand is a carefully executed ‘Putchu Guinadji’. Modeled casting with elegant curves, tapering legs, and highly detailed tack, bridles, and saddle. Small and therefore portable, these figurines were personal objects used as protective amulets around the neck or sewn in a small leather pouch and worn close to the body to be carried for their therapeutic value used as a talisman against madness and witchcraft. 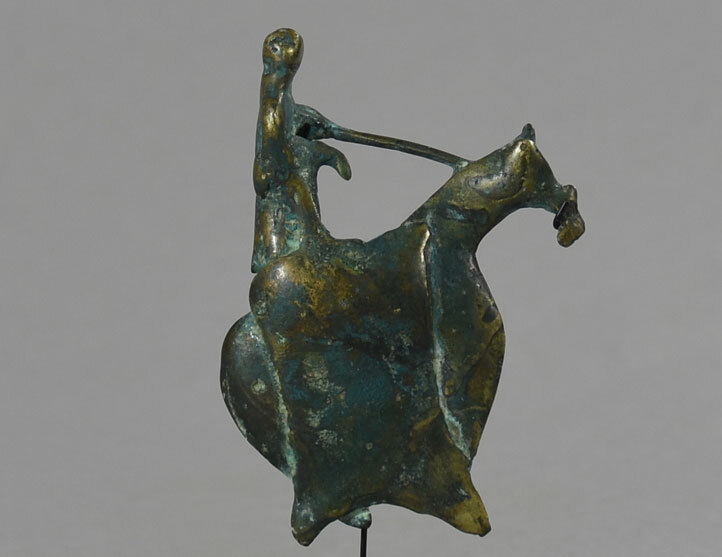 These cast equestrian figures, excavated in Chad, was cast by the Kotoko peoples.The Kotoko are descendent of an ancient people known as the Sao who lived in the southern Lake Chad region as early as the second Century BC. Under external pressures the Sao moved into northwest present day Cameroon, over time, settling in the hilly region where the present day Kotoko claim them as ancestors. The Sao had disappeared entirely by the end of the 16th Century. The Sao peoples buried their dead in large urns, a practice seen across a wide region stretching from the Niger River through Chad, Niger, Nigeria and to the northern regions of Cameroon. 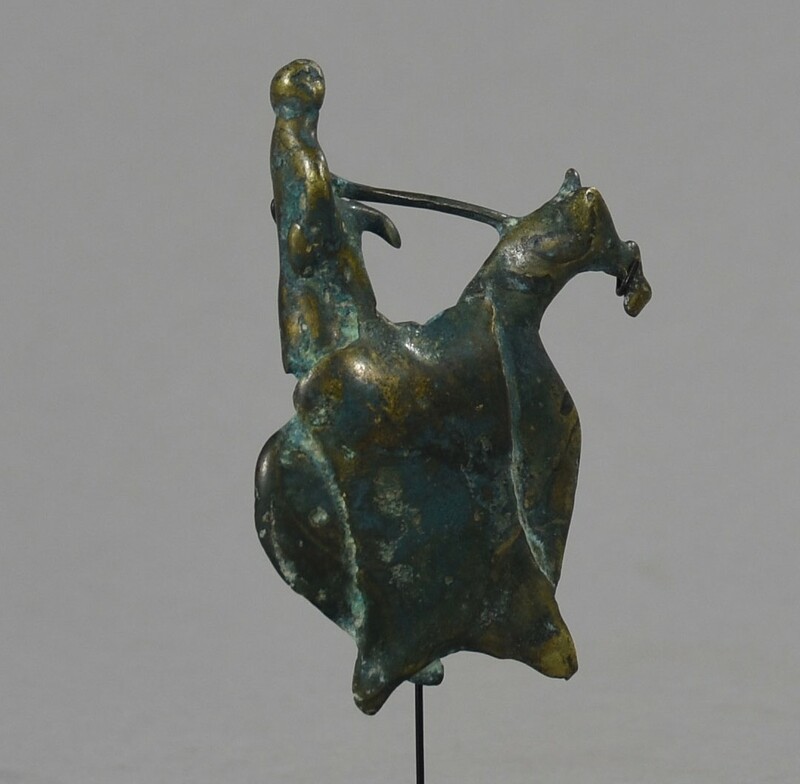 Small mounted figures cast in bronze were made as funeral offerings or memorials. 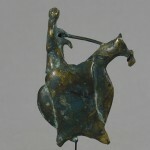 Mounted warriors rode horses, sometimes camels and other unknown and imaginative animals. 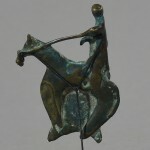 Often there were two riders mounted on a single animal. The horses have elaborate trappings of harness and saddles and the riders were portrayed wearing detailed headdresses, costumes and jewelry. This is a small scale and plain example of this very old tradition. Little is known of the Kotoko civilization, but the Sao was one of the oldest metal-working cultures in West Africa. called ‘Putchu Guinadji’. ‘Putchu’ is the Kotoko word for ‘horse’ and ‘Guinadji’ means ‘demon’. 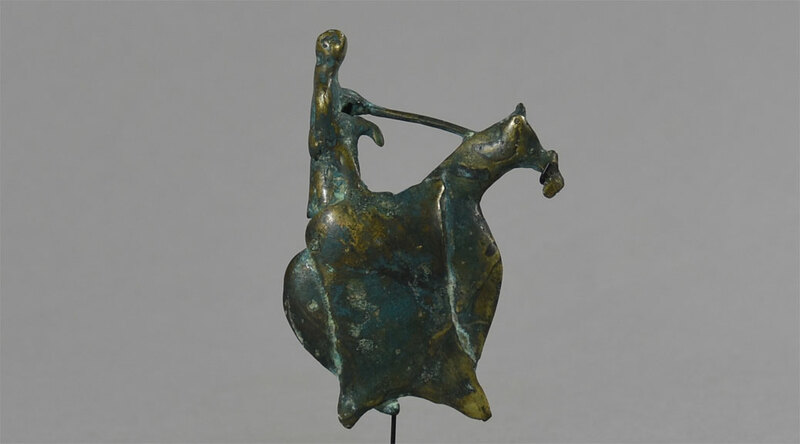 Therefore these amulets represent warlike riders, who defeat all evil demons. Under the instruction of a ‘holy’ man, a ‘Marabu’, these protective amulets are cast in ‘waste mould’ technique out of a variety of metals (brass, copper, silver), and ‘charged up’ by the ‘Marabu’ by means of sacrificial offerings. They are then displayed on leather bands, hidden under the clothes. Dimensions: H: 6,5 (2,7”), L:5,5 (2,2”), W:1,3 (0,5”) Weight: 65g. Provenance: Belgian gallery verifying that the figure was collected in situ 1930th by Belgian collector. ‘Erde und Erz’ by K.-F. Schädler, ill. 531, 532, 533. Peroni, Pierluigi: Kotoko Warriors. 2011. Lebeuf, J.P. and A. Masson Detourbet: La civilisation du Tchad. 1950. Lebeuf, J.P.: Archeologie tchadienne: les Sao du Cameroun et du Tchad. 1962. Jansen, G. and Gauthie,r J.G. : Ancient Art of the Northern Cameroon: Sao and Fali. 1973. Lebeuf, J.P. and A. Masson Detourbet: Les Arts Anciennes de l’Ouest Africain.